So I guess I’ve had my 15 minutes of fame. I was really hoping it would come in a big lottery win or something more ladylike like a pageant title. I have been sure, all my life, that I’d be sitting across from Oprah, Barbara Walters, or Matt Laurer discussing how I discovered that lip gloss cured cancer or perhaps I’d designed a space that was so beautiful that it caused world peace or even that I’d written a book that stayed on the best seller list for years. I never envisioned I’d be outed as the animal weirdo I am on USA Today. Sometimes I get calls for non-indigenous wildlife. I like to bandy that word about because it makes me sound smart. 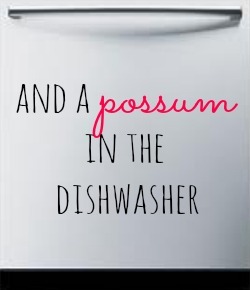 Actually, in pure southern redneck, it just means they’re not from around here, y’all. One afternoon about 10 years ago I got a call from Chattahoochee Nature Center about a big turtle. Now, I’m a caring individual but it was rush hour, I was on my way to a baseball game, I was dressed really cute and just didn’t want to go. I put on my “smart” voice with the man and told him just to leave the big turtle alone and he’d be fine. “Lady” he kept repeating, “you just ain’t getting it”. So I drove the angry aggressive 20 miles to see this terrible turtle disturbance. When I drove into the apartment complex, there were about 25 little international children all huddled in a circle along with several adults. I got out, still puffed up and grouchy, and they all moved back with their eyes wide and their mouths agape. 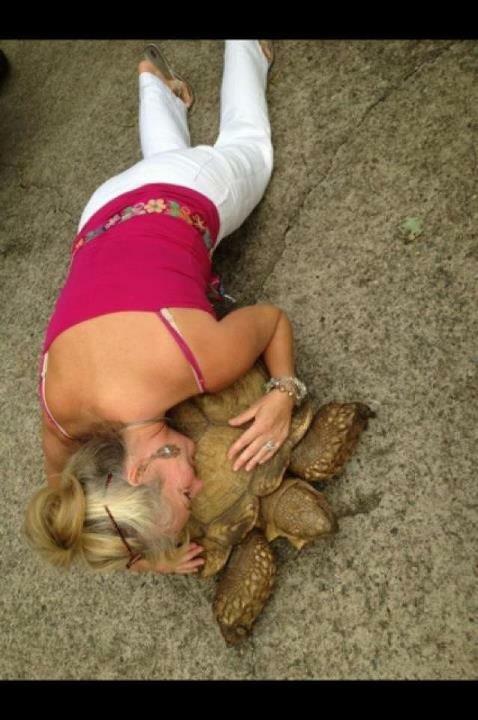 What reposed on the ground between them all was a tortoise of such epic proportions that it boggles the mind. He was almost 4 feet long, his shell came up to the average man’s knees and he outweighed most women. After belting out something inappropriate in front of minors, I apologized to the caller for being what my mother would have called “a toothead”. Three of us squeezed him, huffing and puffing, into the back of my giant SUV and I called home to tell them I had something BIG to show. Tortellini became such a part of our family that I described him as a sweet, dotty uncle who devours my hosta and poos in the yard. Already an old man, he had charm and charisma out the wazoo. If I sat down on the sidewalk, he would spy me with his beady little black eye and motor towards me, trying to climb into my lap. Upon seeing the horses grazing or the dogs playing, he’d make a beeline towards them to join in the social free-for-all. When he became lost, the entire county turned out to help. Signs went up, local papers jumped in and the Atlanta news ran stories of his disappearance. A brief word on how he “escaped”. The Golden Goose left the gate open. There, I’ve said it. I also received a new car the next week, not that I believe this has anything to do with it, but needless to say, the Goose was sweating. Once Tortellini was found, other channels wanted in on the story. We were interviewed, photographed, measured and quoted. I was pictured after I had flung myself on him in the driveway, my uncolored roots exposed to the entire world. I was memed and reposted. USA Today picked up the story. I have reason to believe that once this hit the satellites, Tortellini Hays was broadcast to alien life forms across the universe. He has his own Facebook page with more friends than my husband and me combined. This is not how I planned to become famous. Now, while I lurk, middle aged and tarnished in the shadow of his glory, my only hope is that he’ll allow me to stay around to shine his shell once he hits Hollywood! 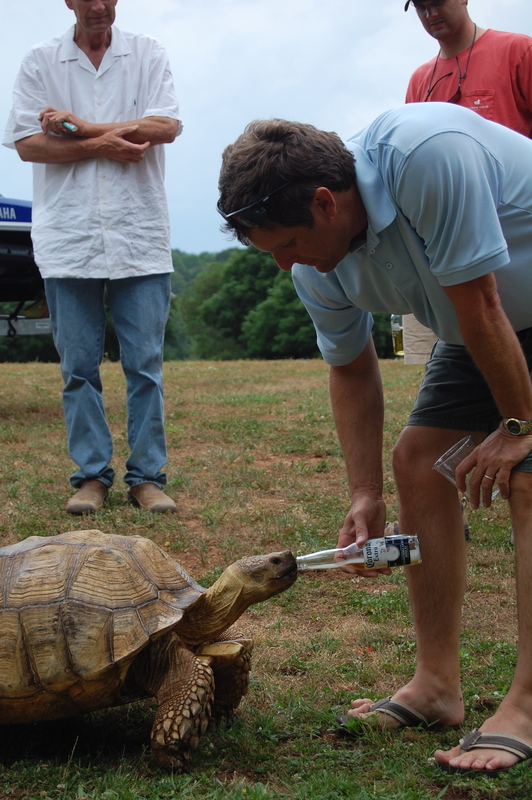 And, no, animal rights people (of which I’m one) DO NOT get up in arms about a tortoise drinking beer. Of COURSE he wasn’t really drinking beer! He’s a martini man, through and through, shaken, not stirred. I am sooo glad I found you! I believe we are kindred spirits. If we knew each other we would be BFFs. You have a Golden Goose…I have Big Daddy. We both love animals and seem to collect the “special” ones. We lived in Atlanta for about 9 years, 19 years ago and my daughter still lives in Marietta, so I am there quite often visiting the grands. Love your stories and your wit. Makes my day to read it! Love your story and what you do for animals!